Hello. My name is Sarajane. I currently have an approved Jyn Erso costume. 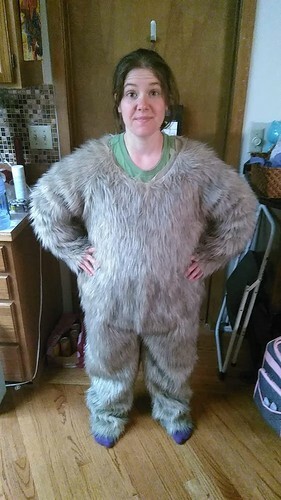 I am now working on an Ewok costume. 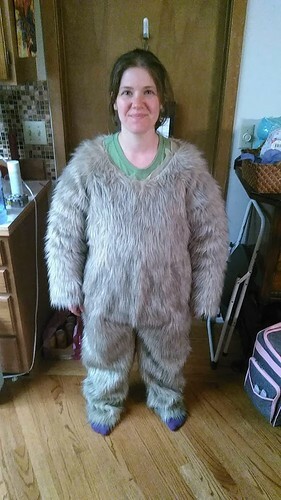 So far I have worked out a body-suit pattern, cut it out of fur and started sewing it together. 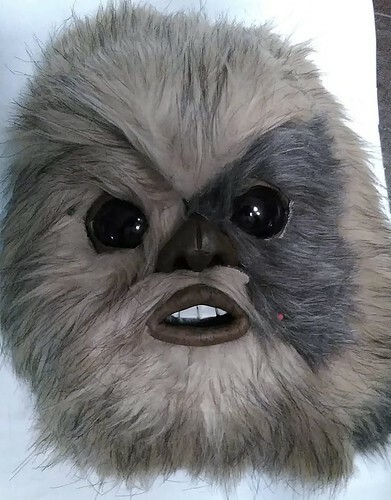 I plan on making a 'sub-suit' out of light mesh fabric with boning/tubing to fill-out my Ewok. I need to go get the tubing, but I have the other materials for that. 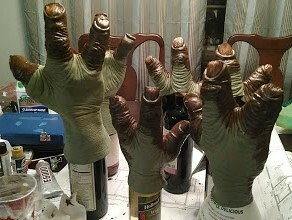 I plan on modifying some latex yoda gloves for the hands base. I will need to trim the claws and shorten the fingers, as they are quite huge on my small hands. I have some old latex 'hobbit' feet I am going to up-cycle into ewok feet. They are quite large so i can use three of the toes. I will fix them (one has a hole in it...), paint them, attach them to some other shoe base, and add fur. Here is what I have for the mask. I have used a creepy baby doll mask as the base. I was a little worried it would be too flimsy, but with the foam glued on top if it, it seems fine. 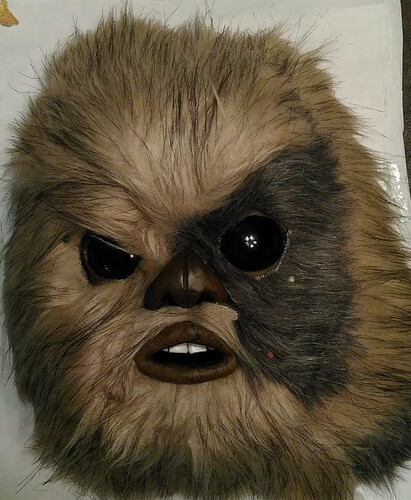 I have a friend also building an ewok; she made the eyes, nose, lips and teeth for me. I painted the mouth and nose. The fur is greyish tan, somewhere between these two photographs. The fur isn't glued down yet. It is only pinned. I have eyelids, or rims or whatever they're called all the way around the eyeballs, but you can't see it because there is no where to pin the fur down on the inside of the eye. The fur ridges above the eyes are a bit thick because I haven't cut the fur there yet, only folded it under. 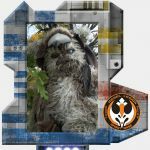 And networking through Chirpa's Ewok Army on Facebook is going to help you, too! Hello. We worked on fingers and toes yesterday. I wanted to get an opinion on the color though. So here's a picture. The paint is a bit darker than my ewok's lips. We haven't addressed the nails yet, but plan on painting them a greyish tone. Are these too dark? Is there any kind of guideline concerning skin tone? It is hard, of course, to get a good picture of SA fingers and toes. We are using a mix of liquid latex and acrylic paint to paint them. We trimmed the nails and filled in the holes, and shortened the fingers and I made my palms smaller. (the one in the middle is a good example. The original Yoda gloves were comically large on our little hands. How big was the person they expected to play Yoda, anyway? I digress.) 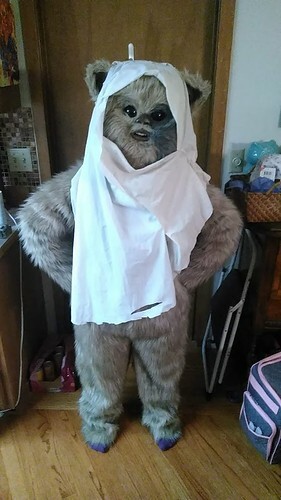 My friend, also making an Ewok, cut away the back of the hand where the fur will be, and the 3rd set of hands with the still long fingers are for her feet. My feet are still in the Frankenstein-them-together phase, and have no paint. I can absolutely make the paint lighter, if needs be. We like the dark brown, but I just need to know that it is going to past muster. Darker is fine, as long as it's not too far away in color. My guess is it's probably fine. Hello , I see that there is a minimum height requirement for being a wookie, but is there a Maximum height for being a wookie?, I am 5'10''. No worries, I got your intent. 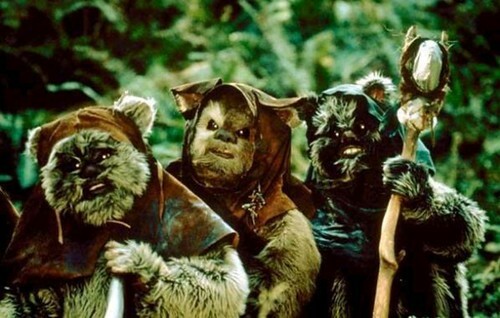 There are no height restrictions to Ewoks. I have been working on the under-suit, (I am calling it the "hoop-skirt under-suit") I need to know if I should add any hooping to the legs. I believe shortening the legs will help a little with the wrinkling. Here are some pictures.